If you actually wanted to play Richard Garriott's masterpiece, Ultima IV - Quest of the Avatar, on real contemporaneous hardware, and had a choice of the platform to select, which platform you choose? Would you choose the original Apple II, the Atari 8-bit version, the Commodore 64 version, the IBM PC version, the Atari ST version, the Amiga version, the NES or the Sega Master System (Europe Only) version? Outside of Japan, these were your choices. Putting the console versions aside, which are not quite 100% faithful to Garriott's vision (the SMS is very close and quite enjoyable and easily puts the NES version to shame), the version to play is the IBM PC version. That version may not have the nicest looking introduction and has no music, but what it does have is the advantage of speed. It is the only version that can officially be installed to a hard disk. All the other versions had to be run off floppy drives. The 8-bit home computer versions typically required disk swapping with four disk sides. Ultima IV accesses the floppy drives a lot. Every time you enter or leave a town or castle, the game needs to load the next area from the disk. Every time you initiate a conversation, the game needs to access the disk to load the NPC's responses. Every combat requires a load. There is a load for each 16x16 tile boundary crossed. 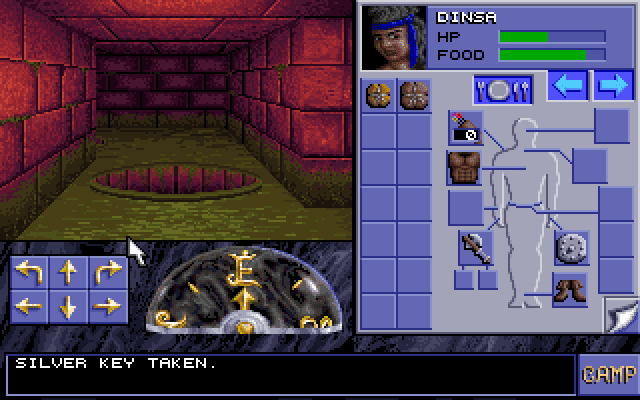 On the 8-bit systems, entering or exiting a dungeon requires flipping the disk over. 8-bit systems have slow floppy drives. The Apple II is the fastest but does not really have a hardware disk controller. The Commodore 64 and Atari 8-bit machines have hardware disk controllers in their drives but their systems speeds are crippled by the slow serial buses these systems use to connect their floppy drives. Try any of these versions in an emulator with the authentic disk drive speed on and see how much fun you will have. IBM had a true disk drive controller and an adapter solely for the disk drive, so its disks transfer with comparative speed. Hard drives were not standard on the Atari ST and Amiga in the first few years of their lives, so these ports were not designed to be hard drive installable. Ultima IV on the IBM PC suffers from an absolute lack of music. When the port was released in 1987, supporting the EGA card was considered a big deal. Sound cards were at best an emerging technology, and the only PC compatible systems that had a music chip were the discontinued IBM PCjr. and Tandy 1000 series. Although there is a patch for the PC version that adds music, and later combined with a patch that adds VGA graphics, it requires a 386 to run at all. Moreover, the PC Speaker sound effects and spell effects are lost due to the increased speed. It is not suitable at all for machines which Origin targeted. The music is not really a big deal. Relatively few Apple II owners owned a Mockingboard and the game itself, and without that, there was no music on the Apple II. Atari 8-bit users did not get the music due to Origin not feeling the need to support 64KB Atari machines. The Commodore 64's music is not that great, neither is the Atari ST or Amiga's. Besides, there are only eight music pieces in the game (Towne, Castle, Wanderer, Combat, Dungeon, Shoppe, Rule Britannia and Shrine), and they get old very quickly. Ultima IV scales reasonably well on low end machines. It runs extremely well on my Tandy 1000SX in the 16-color Tandy Graphics mode at 7.16MHz, and it also runs well in 4-color CGA mode at 4.77MHz, making it suitable for IBM PC and XTs. The IBM PC version requires 256KB RAM. The Apple II and Commodore 64 versions require 64KB and do not utilize extra RAM. The PC can load conversations and combat scenes in memory. The increased loading speed of a hard drive means that loads from a hard drive can occur much more quickly than even the 16-bit machines. With real floppies, the game will check the floppy to ensure that the genuine article is being used, but there are cracks and the CD compilations do not suffer from the checks. Ultima IV is not atypical of the Ultima series or PC ports in general. While many PC ports were graphically or aurally inferior to their Apple, Commodore and Atari counterparts, they can run far better than any of those on real hardware. The 8-bit machines required accelerators (except for the IIgs, which could accelerate 8-bit Apple II software), which are hard to come by and can screw up timing. Non-PC 16-bit machines also tended to be tricky to get working faster. PC ports by the mid to-late 80s were programmed to be at least somewhat flexible in regard to system speed. In this case, once you get beyond character creation, the 16-color EGA and Tandy graphics are almost on par with the Atari ST and Commodore Amiga graphics. The only issue I have with the PC port is with the keyboard movement buffer. The keyboard movement buffer will buffer up to eight keystrokes if you hold down a directional key. At the 4.77MHz speed, however, the keyboard movement buffer will always store up to four to five presses of a directional key if you hold the key down. On AT-class machines you can terminate the buffered movement keys by pressing the space bar, but that does not work at the 4.77MHz speed. SSI will forever have a place in the hearts of computer RPG fans for bringing the Advanced Dungeons and Dragons ruleset to personal computers, beginning in the form of the Gold Box games. 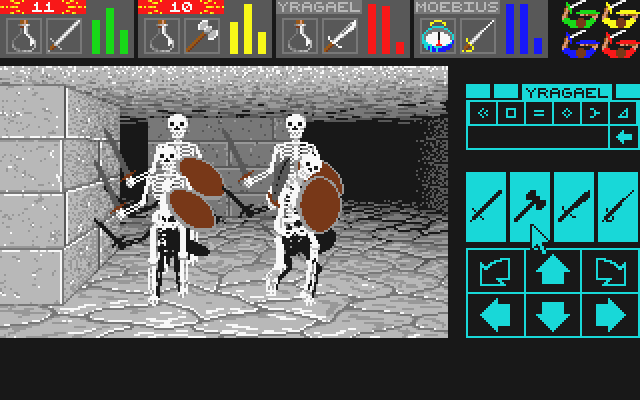 The Gold Box engine was originally designed for the Commodore 64, and its top-down tactical turn based combat was one approach to interacting with a game world, other approaches existed. The game Dungeon Master was very popular in the late 1980s on the Atari ST and Amiga. Its real-time first person 3D perspective was innovative, even if you could only turn 90 degrees. A port of this popular game to the IBM PC platform was slow in coming, so SSI commissioned Westwood Studios to make a game in the same style using the AD&D license it had. The result was Eye of the Beholder, which was slightly simplified or streamlined compared with its inspiration. One feature that EOB had over DM was that the player could create four player characters from scratch, adjust (or max out) their stats, and choose their character class. The graphics supported 256-color MCGA/VGA, an improvement over the 16 colors of DM. The sound of EOB was fairly simple, supporting the PC Speaker, Tandy 3-voice chip or the Adlib. This game was all about slaying monsters, solving puzzles and trying to avoid traps. Since fights occurred in real time, fast maneuvers became important, especially with tough enemies. You can attack enemies on their flanks, but they can attack yours as well. Being surrounded meant that you could not move and unless you killed your enemies quickly, you were doomed. Only the front rows could attack with melee weapons, the second and third rows could only use thrown weapons or spells. Since this was a first person perspective game, all characters could only attack one way. Automapping was not a feature in the original DOS version, but was available in some of the later ports. Like DM, the EOB series required the player to find food for the party to eat, either in the form of rations or with a Create Food spell. The style of the game meant that the actual implementation of the AD&D, 2nd Edition system was simplified. Classes were basic, but the game engine imposed limits on the more unusual classes like the Bard and the Druid. Item manipulation on the main window required the use of a mouse, just like DM. Spells were generally limited to attack, defense and healing spells. Magical items concentrated heavily on weapons, armor and wands. Attribute bonuses, saving throws, THAC0 and Armor Class were all present. Alignments were generally not important to the game. Your party is good, the monsters you fight are evil, and that is as morally complex as it gets. This being 1990, and not 1987, players expected a bit more than to just read the manual and then thrust themselves into the game. There was an opening cinematic outlining the plot and music (until you entered the game). The plot was thin, even by 1990's standards, but if people wanted a good plot in a computer RPG, they would play Ultima VI. The various levels of the dungeon had different designs, from the red brick and slime of the sewers to the stone work of the dwarven levels and the onyx designs of the drow. Sound effects were especially important, as the various noises could tell you how close enemies were. There was a special portal system to allow your party to warp to various levels in the dungeon. The game was a big success, and successes equal sequels. 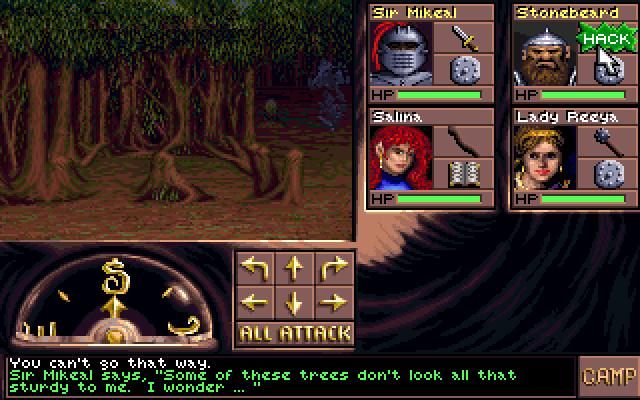 The next game in the series, 1991's Eye of the Beholder II : The Legend of Darkmoon, used the exact same engine but made several improvements to the gameplay. The opening cinematic was pretty spectacular when people first saw it. Outdoor areas were added, and the game was far larger than its precessor. There was an ending cinematic, which was sadly absent from the MS-DOS version of Eye of the Beholder. The monsters were more varied and more devious. The game was more difficult and could at times be cruel to the player. Items were not quite as nice as the first game. From the EOB2 Intro : Look into my eyes, you will accept my quest! The starting level for characters began just about where EOB left off. Westwood Studios took inspiration from the Gold Box games and allowed you to import your characters from EOB. Imported characters retained virtually all of their equipment, unlike the Gold Box games which generally found a way to nerf your characters almost every time you imported them from the previous game. Even with your high-powered and over-developed characters from the first game, it was still hardly a cakewalk. Perhaps due to the increase in difficulty, the game offered multiple save slots whereas the original game only supported one save. Even without support for digitized sound, the second game was successful and improved on the weaknesses of the first game without alienating the fans of the first. Both games ran pretty well on modest (386SX) hardware, and did not require EMS other types of exotic memory management. For 1991, this was acceptable. Westwood Studios was not involved in the development of EOB3. Instead they used the engine to make the well-regarded game Lands of Lore : The Throne of Chaos. SSI chiefly wanted to add digitized sound support to the EOB engine. To do that, they hired John Miles, later famous for his middleware Miles Sound Drivers, to revise the engine. The original EOB1/2 engine was strictly meant for real mode and 640KB of RAM. Instead of just requiring EMS, which would have solved the problem of storage for sound samples, Miles rewrote the engine, called AESOP, to use the 16-bit protected CPU mode. From the EOB3 Intro : Seriously, would you accept a quest from this guy? 16-bit protected mode was supported by the 286 and above processors. By contrast, DOOM used a 32-bit protected mode and only worked on a 386 or better CPU. By the time the game was released in 1993, nobody cared about the 286 and SSI did not even state that the game worked with a 286 on the box. The engine's performance on anything but high end hardware was dreadful. There is a patch to convert the game to use a 32-bit version of the engine, but it has issues with sound stuttering with real hardware and current versions of DOSBox, (it works in DOSBox 0.73) but apparently plays more smoothly than the original 16-bit engine. Regardless of engine, loading a save game takes far longer than it should especially compared to EOB 1 or 2. EOB 1 and 2 shared a connected plot. EOB had no connection to the previous games other than it occurs after your party returns victorious from Darkmoon. The plot is not particularly developed in the game, and the story in the manual has, at best, only a thematic connection to the game's plot. The opening cinematic for EOB3 is nowhere near as impressive as EOB2's was. The digitized sound that SSI and Miles were so keen to incorporate into the game detracts from the immersion instead of adding to it. The ghosts in the opening level and the undead warriors in the mausoleum make machine-like noises. The sound is extremely loud, usually unpleasant and it never seems to stop. Turn down your speakers or your significant other will make you turn them down or order you to put on your headphones. On lower end machines, the game will pause at times for the sound samples to load off the hard disk and into memory. Playing with the digitized sound on on these machines can make for a really choppy playing experience. In addition to FM music, the Roland MT-32 and compatibles is also supported, but outside the introduction music is heard so infrequently in the game that it does not really add to the game. The greatest innovation this game could boast is the All-Attack Button, which let all party members selected attack at the same time. There are some new portraits for your characters this time around. Characters with polearms could attack from the second row, but that is it for the positive innovations. The difficulty in this game was all over the map. The first level of the mausoleum, which is usually the second level you encounter in the game, is almost certainly the hardest level in the game. Most of the rest of the game is comparatively easy, even the final level. There is a very difficult part just before you meet the Lich, however. Other than that, the game is easier than its predecessor. The Lich himself, who is supposedly the main antagonist in the game, is a pushover. The game is (eventually) generous with items, but your mage will have a difficult time gaining the levels needed to memorize all the high level spells in the game. The opening level in the graveyard is extremely tedious due to all the time you spend hacking away at trees to find hidden alcoves and eventually the exit to the forest path to Myth Drannor. Its also almost an entirely open space, and with no automap it is difficult to figure out where you are and where you need to go. Import axes with your characters from Darkmoon. As a result of EOB3, SSI declined to make more games in the series and it is now fondly remembered by its fans as the last of the great games from SSI's AD&D license. It did release a tool called Dungeon Hack to allow players to make their own levels using the EOB engine, but it was not as successful as the similarly featured Gold Box engine tool Forgotten Realms: Unlimited Adventures. SSI would make more AD&D games in the first person format, but none of them garnered the critical acclaim or sales figures of the Gold Box or the first two Eye of the Beholder games. Westwood Studios would go on to make Dune 2 and the Command and Conquer series. FTL only made one more Dungeon Master game before going out of business.